What is an Enduro ? As the name suggests, enduros are an endurance style of riding, quite often spending four or more hours on your bike. Don’t be put off though, they can also be one of the most rewarding and challenging types of events you can ride. In simple terms, an enduro is where a rider follows a pre-determined course, marked with arrows through the bush. Each loop or Trail Section is usually around 30km in length and made up of everything from wide open fire trails to narrow tracks through tight bush, sometimes mud and creek crossings get thrown in for some good fun as well. Each Loop/Trail Section leads back to a “Control Point” at which you can fuel up, have something to drink, eat etc before checking in and proceeding onto the next section. You are given a time to complete each trail section. During the day, there are also “Special Tests”. These can be a section of the trail that you are timed on, usually called and “Enduro Test” or a completely separate section close to the control point, called a “Cross Test”. It is the fastest rider in these sections that determines the winner in each class. One thing about riding enduros, there is more to them than just riding fast. There have been a lot of fast riders that never finish the day. Bike preparation, mental and physical preparation, planning your day and pacing yourself, all have as much to do with winning as riding flat out. They are great fun!, and compared to a lot of motorcycle racing you get to spend plenty of time riding your bike. How to Enter an Enduro? All T & E event entries are now done on line via this website. Find the Calendar page and this will have all the details (Supplementary Regulations, Map and On Line entry link) – read the Supp. Regs! They have all the specific details pertaining to that event including the organiser’s contact details. You will need a valid Credit Card, your bike details, Driver Licence No. , MA Licence No. (if you have one) and your own personal details plus an emergency contact (name and phone number). Also a valid email address for the receipt to be sent to. Once you have completed the entry process and your receipt has been emailed to you we recommend you print off the receipt and bring i to the event with you. The reasons behind using on line entries is to cut the administrative overhead of processing not only the entries but also the payments. Using this method your entry is processed there and then and payment is also confirmed. Previously it could take the event organisers months to follow up on outstanding entry fees. The event Race Secretary can download a nice Excel spreadsheet containing all the entrants’ details after the entries have closed. What to do when you get to the Enduro? Go to Entry/Registration and sign in. Make sure you don’t forget to bring your on line entry receipt, driver’s licence, T & E membership card, MA licence (if you have one) and bike registration papers. If it is your first enduro and are not sure about something feel free to ask questions we all had to start somewhere. Normally after the compulsary Riders Meeting an experienced club member will give new riders a briefing on what to do. You will be given your race number, start time and time card when you enter/register. Hint: Make sure you put your number on the right way up – 98 is different to 86 – and don’t laugh this does happen and they are hard to peel off. Complete your time card. There will be a board with Start and Trail times posted. Find your Start time and follow the line across, these are the times you need to check in at each control. Take your time and double check what you have written down. The distances between each control are also on the board and its a good idea to know how long each loop is so you can pace yourself and from a refuelling aspect as well. Hint: Some riders will use a piece of Duct tape and write down the Control number and due time. This can then be stuck on to your tank or top of your bumbag for quick reference rather than having to dig out your time card to check. Filling out your time card correctly is YOUR responsibility – if you are not sure ask someone to double check it for you and maybe do the same for them. There’s no allowance at the end of the day for making a mistake with your times on your card. Double check your bike is ready. Full of fuel, chain lubed and tyre pressures checked, ready to go. If you’ve been given numbers stick them on the front headlight shroud (Must be a light coloured background) unless told otherwise. Push your bike through to the Machine Examination area. Make sure you’ve got your registration papers, and helmet for inspection. Once your bike enters the “parc ferme” (usually a bunted off area)you are not allowed to work on your bike or re-enter the area. Get dressed; by now time is slipping away, get all your gear on (except helmet at this stage). Start drinking lots of fluid. The Riders meeting will be announced and it is compulsory so don’t miss it !! The course, colour of arrows to follow, time’s for each loop, what to watch out for and when the “special tests” are, all get talked about. Listen Carefully! Have you got everything, bum bag, helmet, gloves, and hydration pack? Ready to go! Always be ready to go at least 5 mins before your start time or due time. It will be amazing how quickly the last few minutes fly by. 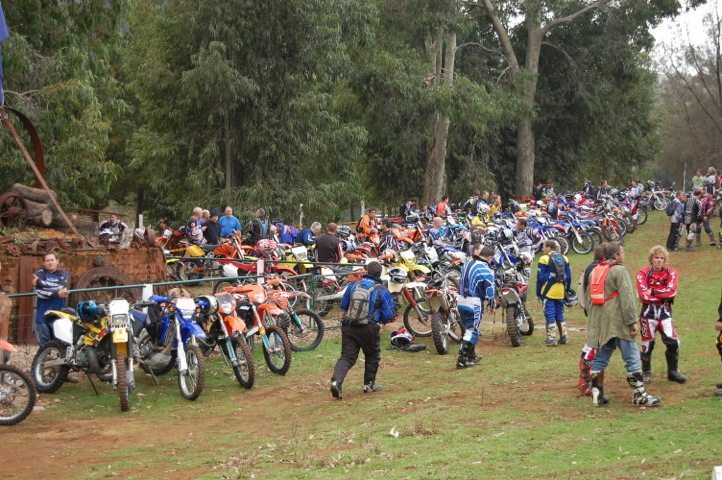 There are lots of rules to learn as you start riding Enduros, one of the most important is Don’t start your bike until your start time (minute) comes up. Enduro’s are a cold start. Warm your bike up over the first few hundred meters of the trail. Once you’re going on the trail, it’s all about fun and pacing yourself. The course is marked out through the bush with arrows. Usually a different colour for different loops. A Directional arrow at 90 degrees indicates a major course direction change is coming up. These warning signs are normally placed at an appropriate distance before the corner. For example on a high speed section it may be as much as 100 m or more before the corner where as in a slow speed section in tight bush it may only be 10 m before the corner. Its purpose is to warn you that a corner or major course directional change is coming up. Two Directional arrows at 90 degrees means turn here and are placed actually on the corner. Please note the corner may be more or less than 90 degrees and the arrows are not meant to indicate how tight the corner is only the fact that you need to turn here. Once the corner has been negotiated a “confirmation” arrow will be placed just after the corner to let you know you are still on the course. Normally associated with corners or other major course direction changes are Wrong Way signs. 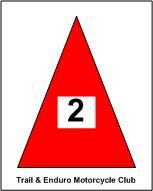 They indicate you are heading off the marked course. For example instead of turning at the marked corner you have carried straight on then you will see a W. If you see one, it is extremely important that you pull over to the left of the track, stop and look, and then turnaround. The number of riders that get T-boned when stopping suddenly and turning around, is quite high, because the rider behind you was probably following your tracks. A Skull and Cross bones, signals Caution as there could be something ahead that requires additional caution whilst riding. Depending on the level of event, club or state round, there may be sections that are divided by signs indicating “Experts Only” and “Others”. This is usually to give the Experts a bit more distance and possibly some harder terrain to traverse. If they are being used for the event this will be explained at the Rider Meeting. The secret is to look ahead and follow the arrows, not necessarily the track on the ground, they could go in different directions, and lead you straight into an obstacle, instead of around it. A control area is defined by three sets of flags. The White flags signal the beginning of the control area/pit lane. All fuelling up and repairs must only be carried out between the White and Yellow flags. The Yellow flags indicate the actual line which is used for time check purposes. The Green Flags indicate the end of the Control area. Speed is limited to 1st gear in the control area, so it is always a good idea to proceed up to the Yellow flags a few minutes before your minute is due. Once your minute ticks over push/ride your bike into the control area and hand your time card to the control personnel. (This time will then be recorded on your card for future reference at the end of the day). Proceed out of the control past the Green flags, and out onto the next section. One of the hardest things for many riders is to realise that the time on their card is the time due in to that control. Don’t pass through the Yellow flags and hand your card in until your time is due, and you are ready to leave, fuelled up etc. If you come into a control and find that your minute has already come up, ie your running late, be careful, are you ready to go straight out again? You can’t make up for lost time in an enduro. If you were 2mins late, you need to add that 2mins onto each control time of the day. If you were due in at the next control at 11.05 you would correct your card to show a new due in time of 11.07 to allow for the 2mins late at the previous control. Remember you cannot make up time lost. Push your bike (if possible) to the control person, only hand your card in when your minute has come up, get your card back and proceed out into the next loop. Check what time has been written down, mistakes can happen and it is your responsibility to ensure it is correctly recorded. As I mentioned there are a lot of rules that go into riding an enduro. Don’t be put off, there is always someone willing to help and explain them. 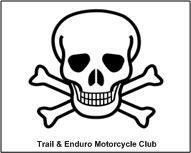 They are set out in the Motorcycling Australia handbook (GCR’s) in the Enduro section. What type of Bike will I need for an Enduro? The trend since the early 2000s, though, has been to use MX racing bikes as the platforms for Enduro bikes. This was partially driven by the conversion of MX from 2-stroke to 4-stroke engine designs to comply with regulatory trends. Enduro or so-called “Trail-bikes,” or “Dual-sport” (dual because they are capable of moderate off-road and moderate street-performance, while excelling at neither) traditionally had a much higher proportion of 4-stroke models. The power-to-weight ratio of these 4-stroke trail bikes wasn’t great by today’s standards, and that had to do with the lack of emphasis on meeting a weight lower-limit. When the conversion to 4-stroke MX bikes began, there was suddenly an emphasis on power-to-weight ratios for off-road 4-stroke motorcycles, because 125 and 250 MX classes have minimum weight limits. Once these bikes entered production, the manufacturers decided that rather than inventing the next generation of Enduro type 4-stroke bikes, they would simply re-configure their existing 4-stroke MX lineup for Enduro. Accordingly, they made the above listed configuration changes. The end result of all of this is that today’s Enduro motorcycles, which are predominantly 4-strokes are lighter and more powerful than ever, but have many of the same characteristics of their MX cousins. These bikes, which were originally engineered to be MX bikes, do not often stand up to the rigors of long-term Enduro use. In the quest to achieve lower weight and higher power, the manufacturers made many compromises (i.e., thinner walls, lighter materials, more stressful designs, etc…), the downsides of which aren’t always evident in MX where the races are relatively short and the bikes are thoroughly serviced after each event and replaced after every season for serious riders. In the case of Enduro riding, these compromises became painfully evident when the bikes were subjected to the harsh Enduro operating conditions. One such example is the 2004 Honda CRF250X Enduro bike, which was based on the CRF250R MX bike. The valves were notorious for needing to be constantly adjusted and even replaced in many cases. Neither procedure is trivial. This issue has apparently been rectified on the 2006 models, due to a reported valve-seat material change on the cylinder head. In contrast, the comparable Husqvarna model TE250, which is purpose built for Enduro riding, is not only low maintenance by comparison, but the types of maintenance that are required more frequently on bikes that are used in Enduros are much easier to do because the bike was designed with those procedures as a design concern, such as valve checks and adjustments. There are two types of Motorcycle licencing here in WA and for a fuller explanation check out the FAQ for B Class Registration. There’s a fair amount of uncertainty in Western Australia about what are the registration options for trail bikes. We put together this information page to provide an overview of the current situation. Please note that this information is subject to change and should not be relied upon without checking with the relevant authorities. This level of registration is available to ADR compliant motorcycles and provides unrestricted access to the public roads network. It also includes third-party personal insurance to protect rider against any claims made for personal injury in the event of an accident for which that rider was responsible. Only motorcycles that have a Compliance Plate signifying that the vehicle complies with all requirements for registration are eligible for this level of registration. This means mirrors, indicators, speedo, lights, mudguard extenders etc. It is not possible to simply fit these items to a motorcycle that does not already have a compliance plate in order to register it. Motorcycles must have road registration to compete in this event. 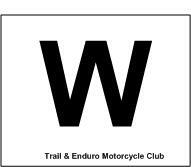 Competitors who DO NOT have ‘A’ OR ‘B’ class registration for their motorcycle will need to obtain a WA Temporary Registration Permit. ALL motorcycles must comply with the standards for Enduro as described in the 2016 Manual of Motorcycle Sport (MoMS)– 14.23.1.2 (pg 181) and 14.18 (pgs 177–178). These conditions are same as ‘B’ class requirements. Motorcycles will need to comply with the event GCR’s, these Supplementary Regulations and must pass event Scrutineering. It is not compulsory for a vehicle that is subject to a temporary movement permit to display number plates. Owners of vehicles that do not have number plates must quote the chassis/vehicle identification number to the issuing officer so that the vehicle may be positively identified on the permit and may be checked by either the Police or an event official as necessary. Riders must carry this permit at all times during an event. Riders must indicate their need for this registration on the on-line entry form and will be charged a $40.00 fee. Please make sure that you have the description of Vehicle, Frame & Engine Number correct on the on-line Entry Form. If the details are incorrect the registration permit will not be valid. Riders applying for a WA Temporary Motorcycle Registration Permit must have entries submitted IN FULL, no later than 14 days before the event or date nominated in these Supplementary Regulations. The operator of the vehicle issued with a permit is obliged to comply with the conditions listed on the permit and these Supplementary Regulations. Any conditions or limitations of use that have been endorsed on the permit by the issuing officer must be complied with. The permit is valid for a period of the nominated event only. This permit is a third party insurance policy issued for the purpose of allowing an unlicensed vehicle to be driven on a road only during enduro competition purposes. If you own a fully registered, ADR compliant bike you have access to all the same public roads and tracks throughout Western Australia that any other registered vehicle such as a car or four-wheel-drive would have access to. If you own a motocross bike or other non-ADR compliant vehicle, or if you own a registerable trail bike but choose not to fully road register it (for example because you have no intention of riding it on the road) then you can purchase a One Event Registration and use it on the road during Enduro competitions (these include non-competitive events such as the Adventure Rally and Capel 200). If you intend to ride your bike on public land anywhere and it doesn’t conform to either A Class or B Class registration then it should be registered as an off-road vehicle and only used in the designated ORV areas. Why do we need sound testing ? Noise is one of the main complaints against motorcycles especially the off road variety. Noise is cited as the main reason for losing riding areas. In order to protect our access to the areas the T & E MCC uses for hosting our events we must take a proactive stance in managing this issue. As of 01/07/2013 Sound Testing must be carried out at all permitted events however it is not mandatory to test all machines. The T & E Club has purchased a Sound Testing Kit and some club members are now qualified M.W.A. Sound Control Officers trained to noise test motorcycles. The Clerk of Course will select which bikes are to be tested. Also any bikes which failed the Sound Emission Test at the last event where they were officially tested. NOTE : The Sound Testing procedure has changed – refer to section 12.10 Sound Emissions section of MOM for the official version. This is an abbreviated version to give everyone a general overview. The selected bike is moved to the centre of the Testing Area with the front of the machine pointing downwind. The measurement is made with the motorcycle uprightand on its wheels with a hot engine. The Testing Area is basically a 10 metre diameter circle clear of all obstacles with background noise no greater than 100 dB(A). The Sound Meter is located 2 metres from the rear axle at an angle of 45 degrees and is located on the exhaust side of the bike. The meter is mounted on a stand 1.35 metres above the ground. If the bike has twin exhausts then both sides are tested. There are only 2 people permitted within the 10 meter diameter circle, the Sound Control Officer ( SCO ) and the rider. The rider is in control of the bike at all times and is responsible for holding the bike upright. Are you aware of how the test procedure is carried out ? Are you aware your engine will be run at full throttle for approx. 1 second ? Do you agree to have your machine Sound Tested ? NOTE : If the rider declines to have their machine tested it is considered a failure and will not be allowed to compete until it has been sound tested and passes. Similar to refusing a RBT. If the rider agrees to have their bike tested they will be asked to start their machine. The rider will stand on the left hand side of the bike and the SCO on the right. The rider will be asked to pull the clutch in and hold it in during the test. The SCO will open the throttle fully for approx. 1 second. The throttle will then be closed. The SCO will then check the sound meter for a reading. At all times the rider is responsible for holding the bike upright, the SCO will only operate the throttle during the test. The rider will be invited to observe the reading if they wish to do so. This sound emission reading along with the Date, Time and Temperature and other details are recorded in the Recorded Sound Test Log. This log is available to MWA and will be retained in the Club records. The Sound Emission Limit for Enduros is 112 dB(A) with a 4 dB(A) allowance as per General Competition Rules ( GCRs ) 12.10.1.1 Sound Emissions. I have been Noise Tested now what? Depending on the reading one of two things will happen ….. If your bike is over the limit then the SCO will fill out a Sound Test Failure Report. The third is a file copy for the Club records. It is up to the Clerk of Course what action will be taken – not the Sound Control Officer.